Covering the Walsall area, C Pages Web Design is based 3 miles from the centre of Birmingham in the West Midlands. Our Birmingham based web designers offer an affordable website design service to predominantly small to medium sized Walsall businesses looking to tap into the benefits of promoting their businesses over the Internet. C Pages offer both local and national search engine optimisation for businesses in the Walsall area wanting to grow their internet enquiries with prominent website listings in the major search engines including Google. 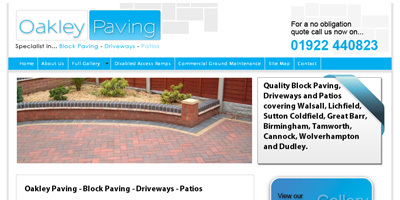 Here are a few examples of some of the websites we have completed for our clients in the Walsall area. The company prides itself on first class workmanship, using only the highest quality materials, resulting in beautiful driveways and patios for all our customers. Having a new driveway or patio is easy and completely hassle free, just call us and we will arrange at a time to suit you to measure and design absolutely free. Then we will quote your job. If you are happy with the quote we will arrange a start date.